Our Nursery children have been learning about the importance of recycling food waste. We obtained ten bags of compost made from locally collected brown bin food and garden waste during 'National Compost Week' in May. 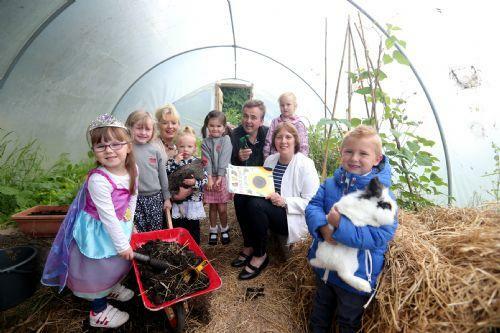 Councillor Jenny Palmer, Chair of the Council’s Environmental Services Committee, speaking about the initiative, said: “I am delighted that children as young as three years of age are being taught the importance of recycling food waste into compost; and that this compost helps the vegetables they have planted in the school’s polytunnel to grow to maturity. The lessons which the children have learnt as part of this initiative form part of the curriculum unit ‘The World Around Us’. Mr Clive Anderson, Principal of Fort Hill Integrated Nursery & Primary Schools, is delighted at the outdoor learning opportunities these young pupils enjoy, and said: “Under the guidance of Mrs Jones, the children were amazed how easy it was to grow food and the importance of ensuring that waste food is put in their brown bins or composters at school or at home. They have also learnt about recycling leftover food for the nursery pets and about the food recycling scheme that the primary school pupils and Fort Hill canteen are involved in. Earlier this year Fort Hill Primary School was filmed as part of the Council’s winning NILGA Award entry in the ‘Sustainable Economy Project’ category. If you are interested in home composting please contact the Recycling Hotline on 028 9250 9453 or log on to www.lisburncity.gov.uk to get a home composter for £5.